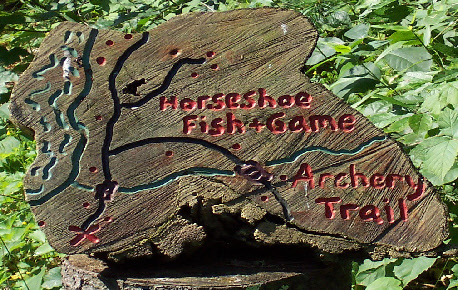 Welcome to the Horseshoe Fish & Game Archery League. Archery leagues are held on Tuesday evenings along the Trail located behind the clubhouse. The league is open to the public, but any non member shooting must have a member present to shoot. Starting time is around 5 p.m.
You will be shooting at foam/bags covered with animated Burlap targets. For each week of the league, you will shoot (2) arrows at each target (15 targets) for a total of thirty (30 arrows) for score. A practice target is available before you shoot for score. • 10, 8, 5 point scoring system used for each target / arrow shot. Spring league starts in May and runs for 10 weeks, with a banquet held on week 11. See the club calendar for specific dates. The cost is $20.00 for the first week and $2.00 for each additional week. The Spring League has been canceled for 2012.